Greetings, everyone. Sorry for the extra-long blogging hiatus. I have recently been wandering the desert in a self-imposed social media exile (well, mostly) due to some other writing responsibilities. If you’ve been upset over the lack of posts on JMP Clinical or statistics, let me just say that my absence isn’t because of you… it’s all me. As you all know, JMP has many wonderful features for visualizing your data. However, today I am going to talk about a recent application of JMP Scripting Language (JSL) that helped me write and send emails en masse using the JSL Mail function. To give a bit of background, I am part of a conference steering committee. Part of our responsibilities involve responding to participants as to whether or not their proposal was accepted for the upcoming workshop. Naturally, this could involve some tedious effort in writing and submitting email, especially if the goal is to customize the email message in such a way as to be most informative for each organizer. Faced with this challenge, I wrote a JSL script to respond to individuals whose proposals were accepted. An artificial example based on dystopian literature is shown in Figure 1. You may need to click on the image to read it. Faced with a rather well-defined structure, the JSL script cycles through each line in the data table to build and customize email text, attach a PDF file of important timelines and send the message (Figure 2). 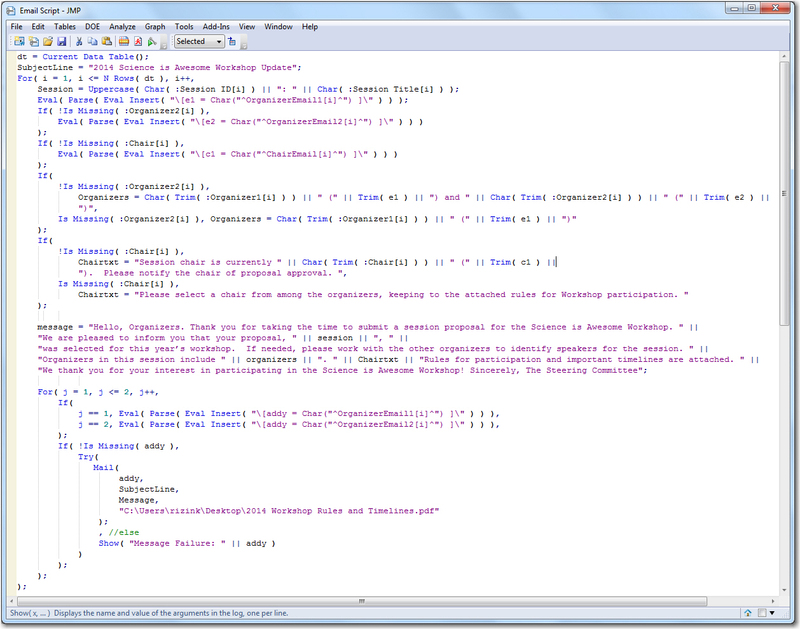 The Mail function is placed within a Try so that if the message fails to send for any reason (such as an incorrectly defined email address), a note is written to the JMP log. You may notice the j-indexed loop towards the bottom. Currently, Mail supports sending to a single recipient, so it is necessary to loop through the number of organizers (up to two in this case). This is the reason for including all organizers in the body of the email. However, if a proposal had only a single organizer, the below script would work (as it does for entry #2). 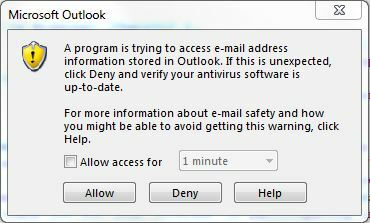 Unfortunately, due to computer viruses of days past, email programs have gotten a bit protective when other programs try to gain access to send an email (Figure 3). In these instances, you can give JMP access for up to 10 minutes, though this still requires approving each email as it is sent. While some may find this button-pushing step tedious, I found it much preferable to writing and tailoring 30+ emails. As a final note, please be aware that the bitness (32- or 64-bit) of JMP currently has to match that of the email software. Please see the note here as to when this issue may be addressed.